Like a Pantomime villain hiding in the wings, the snow crept out to make an unexpected appearance in Pennsylvania. Just as we were getting used to basking in the glorious rays of the spring sun and my testicles had tentatively emerged from hibernation, we were ambushed by a cold, whirling chaos of white. At the same time, our windscreen wipers decided they’d had enough and refused to co-operate. Perfect! We made our way through accident induced traffic to a radio station just outside Philadelphia and were met outside by our East Coast radio plugger Karen. We’d been looking forward to meeting Karen as we’d heard many tales of her verbal directness and rottweiler like approach getting records on the airwaves. In our collective minds she’s began to reach an almost mythical status. We imagined her as some kind of record plugging Kraken that struck fear into the hearts of radio programmers across the eastern seaboard. She sounded brilliant – and she far exceeded all our expectations! Every sentence is littered with expletives as though to hammer home her point so there’s no room for misunderstandings. On occasion she’ll even squeeze a swear word into the middle of a word. For example “I guaranfuckin’tee ya!”. She’s a woman of steely determination but a heart of gold and we fell in love immediately. She hustled us out of the snow and into the building. Her rapid-fire words (mostly unrepeatable) ricocheting off the walls as we went. Waiting to greet us in a boardroom upstairs were a handful of radio staff and the biggest platter of fruit I’ve ever seen. We greedily shoved slices of pineapple and melon into our mouths in a vain attempt to compensate for all the burgers and pizza we’d been living on over the past 5 weeks. We played 3 or 4 songs for the lovely people of WMMR and were then on our way to Electric Factory in Philly still eating fruit as we exited the building. The snow had still not let up as we arrived at the venue and load-in was particularly un-enjoyable. We paddled through ankle deep slush with our gear to carry it up a flight of slippery, concrete steps. This, preceded by a punishing few days of driving resulted in a slightly tired and grumpy rock’n’roll band. Every cloud has a silver lining though and this came in the form of Karen. As well as feeding us (an easy way to keep us happy) she kept our spirits up with tales of her days working with bands such as The Black Crowes and White Stripes and of how she’d persuade radio stations to play their records – with a sledgehammer! She’s definitely a woman you want on your side! It’s a tough crowd in Philly and we had to work hard to win them over but I think we managed it. Despite a few technical issues in soundcheck which saw Paul Sayer performing life saving surgery with a soldering iron on my lovely D.I. Box (thanks Paul) we delivered the goods and were soon back in our van on another two hour drive to a hotel so we could cover some distance between Philadelphia and our next destination, Pittsburg. The venue wasn’t actually in Pittsburg, but just outside in a town called Munhall. The Carnegie Library Music Hall is a beautiful old building that appears untouched since it’s construction in 1896. It has an impressive domed ceiling, a raked stage, wooden backed seats and a tonne of vibe. Also, terrible acoustics for a rock’n’roll band. We took this as a perfect opportunity to do something we hadn’t done in a long time – an off mic version of Chinese Lanterns. It was the perfect venue for it and produced a spine tingling moment that will stick in our minds for years to come. Thank you Munhall. After the show, we went in search of food. Guess what we found?…burgers! We were partly attracted by the name – Burgatory. Who could resist with a name like that? I went with a fairly conventional burger but Paul went off-piste and was required to fill in a multiple choice questionnaire for his order. Iain Graham plucked up the courage to order one of their shakes which was so thick, it came with a straw as thick as my arm. I had a go on it and by the time I’d generated enough suction for the shake to reach my mouth I was ready to pass out. Tasty though! Bed came not a moment too soon and as my head touched down on the soft Comfort Inn pillow, I was out like a light. I’m now sitting backstage in Buffalo, NY. The building is throbbing to the sounds of Blackberry Smoke who should be wrapping up their set soon. We can then go out to sell a few t-shirts and meet some locals. Tonight’s show was a corker, definitely up there in my top 5 shows so far. I’m not sure what the collective term for native residents of Buffalo is…Buffaloans? Buffalos? But thanks guys, you made this happen. 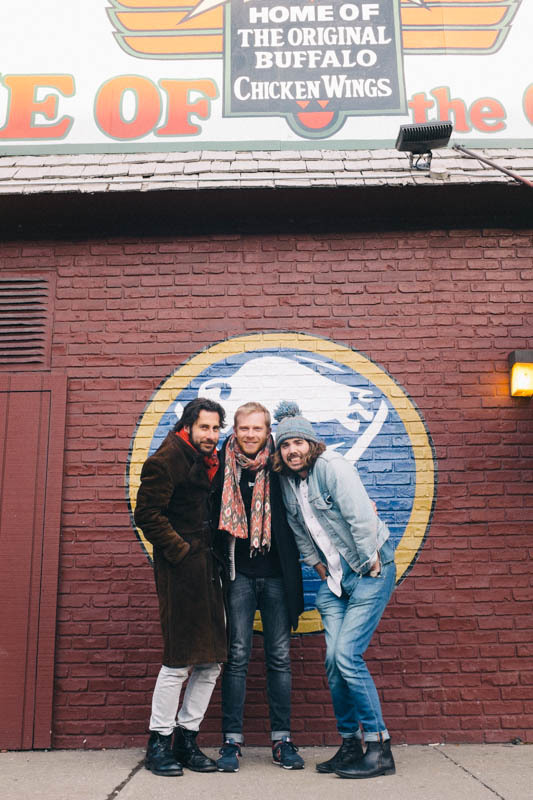 As we were in Buffalo, we had to visit the Anchor Bar where the Buffalo Wing came into existence so, after our soundcheck earlier, we made the pilgrimage to the chicken wing Mecca. I have to admit to being slightly underwhelmed as I gnawed on a stack of spindly looking bones covered in lip burning hot sauce and tried not to think of the unfortunate birds the wings originally belonged to. I can’t imagine that they lived a particularly dignified life before being earmarked for my dinner. So tomorrow we drive in the direction of Burlington, Vermont. I hear the scenery is pretty stunning. It’s a shame we won’t have time to visit Niagara Falls as we’re so close. I still associate it with Superman after first seeing it in Superman II as a boy and it would have been nice to have actually stood there and imagined a man in red underpants and cape flying overhead. Still, we have bigger fish to fry. As Superman was trying to save the World, we are out to conquer it and, with Karen on our team now, I think it’s entirely possible!